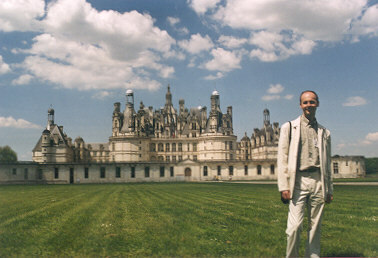 Fabrice Maret, private guide in Chambord, 2002. If you want to learn more about the cities and castles of the Loire Valley, one of the most beautiful region of France, you shall absolutely book for a guided tour with your private guide ! Your guide will tell you the historical anecdotes of these famous places so that you will not only bring pictures back home... but also some unknown stories of French History ! Guided tours for English-speaking groups or individuals. Guided tours of the "châteaux de la Loire"
Guided visit of a "château de la Loire" : Chenonceau, Chambord, Cheverny, Beauregard, castle of Amboise or Clos-Lucé. All taxes (20%) are included. Entrance fees are not included. Free entrance for the guide. Transportation service is not provided but I can meet you at your hotel or at the entrance of your favourite château and join your car. I live in Blois, near the royal château. My firm is located in Tours. 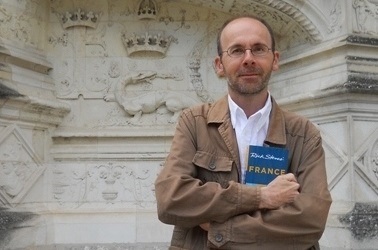 Fabrice Maret, your private guide in Loire-Valley is recommended by "Rick Steves" ! For further information about Loire valley chateaux : www.chateaux-de-la-loire.fr/chateaux_of_the_loire.htm.